This is the Ford Cougar 406 Concept. It's got pop-up headlights, a fuel-injected 6.7 liter V8, and gullwing doors. Too bad America wasn't cool enough for Ford to sell it. Like every concept car of its period, Ford never had any intention to bring the Cougar 406 into production. But come on, this thing is so cool Ford should have broken every rule in the corporate book and made at least a few hundred of these things to shuttle around America's grand touring elite. Hey, it was good enough for Jack Lemmon in Under the Yum Yum Tree. 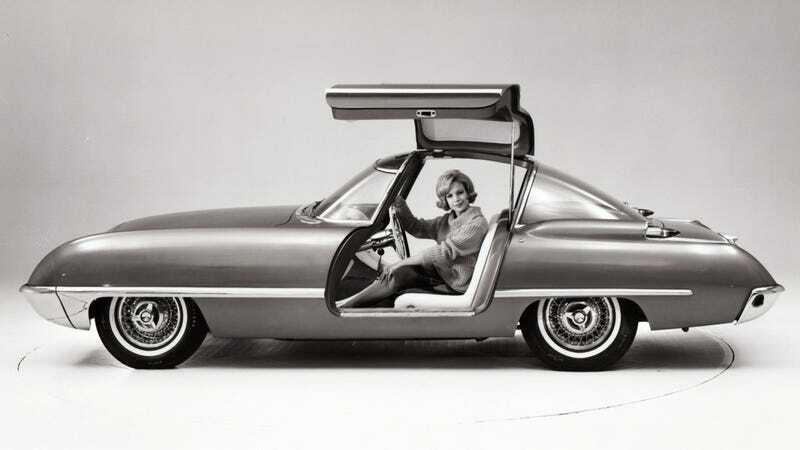 Dean Jeffries built it on a Thunderbird chassis, but I'm sure Ford could've shipped his blueprints to Carrozzeria Ghia and cranked out a bunch if they really wanted to. The truth is, America probably just wasn't cool enough to handle a gullwing door fuelie coupe that looked like it came from Italy. And if we weren't cool enough in 1962, maybe we'll never be.